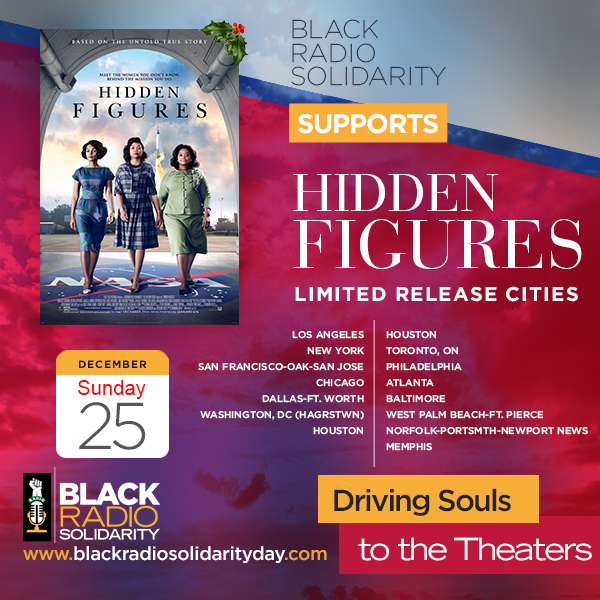 December 21, 2016, Los Angeles, CA – Black Radio Solidarity announces Driving Souls To The Theater on Christmas Day, for the limited release and on January 6, 2017, for the full national release of the inspirational film HIDDEN FIGURES. Listeners of Black Radio, all across the country, are encouraged to support youth by taking young boys and girls to see and experience the incredible untold story of Katherine G. Johnson, Dorothy Vaughan and Mary Jackson – brilliant African-American women and members of Alpha Kappa Alpha Sorority, Inc. who worked at NASA and served as the brains behind one of the greatest operations in history: the launch of astronaut John Glenn into orbit. This stunning achievement restored the nation’s confidence, turned around the Space Race, and galvanized the world. One of the film’s stars, Janelle Monae had this to say about Astronaut John Glenn, who recently passed away, “John Glenn was always on the right side of history. He extended his hand out, and he trusted women, and women of color, with his life,” The visionary trio of Johnson (Taraji P. Henson), Vaughan (Octavia Spenser) and Jackson (Janelle Monae) crossed all gender and race lines to inspire generations to dream big. The film has a limited release on Christmas Day in 15 markets*. The full national release is January 6, 2017. The goal is to fill the theaters with fathers and daughters; sorority and fraternity auxiliary members; families, friends and young boys and girls. 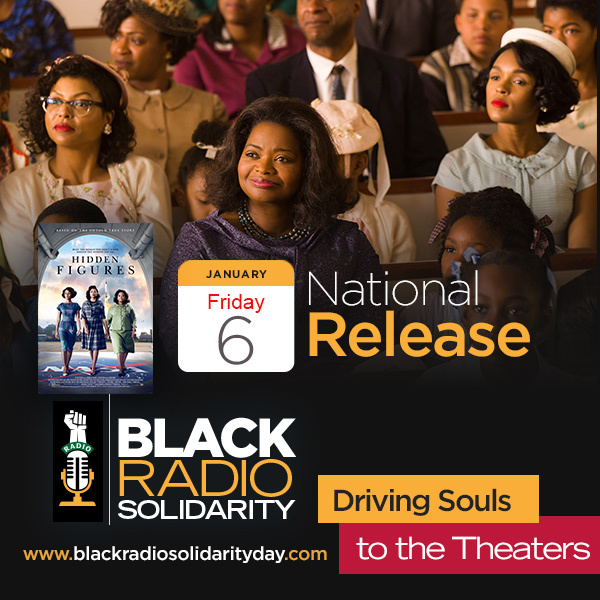 Mark your calendar for Christmas Day and January 6 and join Black Radio Solidarity-Driving Souls To The Theater. All members of Greek-letter organizations are encouraged to take young boys and girls to see the movie to inspire the next generation of Scientists, Technologists, Engineers and Mathematicians. Check the limited release locations to see if the film is playing in your area on Christmas Day. Daughters, take your mothers. They may identify with the struggle and sacrifice these women experienced in order to serve their country in such a monumental way. Community Groups, organize a Movie Day. 5. Consider going to a Matinee, ticket prices are generally lower. The goal is to use the collective media voice of Black Radio to fill theaters with young boys and girls and empower them for academic excellence and provide a vision for considering STEM (Science, Technology, Engineering and Mathematics) careers as a viable options. For more information visit www.blackradiosolidarityday.com, call 1-855-Sheryl-1 or email: emailus@sherylunderwoodradio.com. If you are a Black Radio Station and/or announcer and would like to join the “Black Radio Solidarity-Driving Souls Movement,” visit blackradiosolidarityday.com to sign up. Black Radio Solidarity is the vision of Sheryl Underwood, co-host on THE TALK on CBS television and host of Sheryl Underwood Radio, heard on 73 radio affiliates with a daily reach of 5 million listeners. In November 2016, Black Radio Solidarity Day – Driving Souls To The Polls initiated a get-out-the-vote campaign for the 2016 Presidential Election.